Encode and run PHP 4, 5.x, 7.1 and 7.2 files. 7.1 and 7.2 encoded files will also run on PHP 7.3. 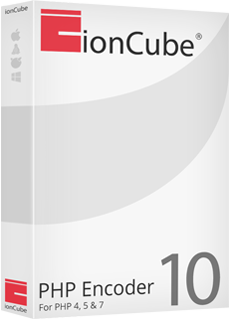 Discover why ionCube is the leading choice for PHP script protection with a Free Trial today. Whether using Wordpress, Drupal or your own codebase, the risk of hackers finding and exploiting a vulnerability is huge. ionCube24 prevents attackers running PHP malware, and offers other benefits such PHP and JS error reporting and service monitoring. Prevent Website Defacement and Malware. Instant blocking of unexpected new or modified files. Reporting of website errors when they occur. The ionCube Bundler makes the creation of auto-executing self-extracting Windows archives from Windows or Linux a breeze! Use the online PHP Encoder for low cost code protection. Run encoded files and add website security using ionCube24 with the ionCube Loader.